People often call chess one of the most intelligent, intense and probably tiring games around. 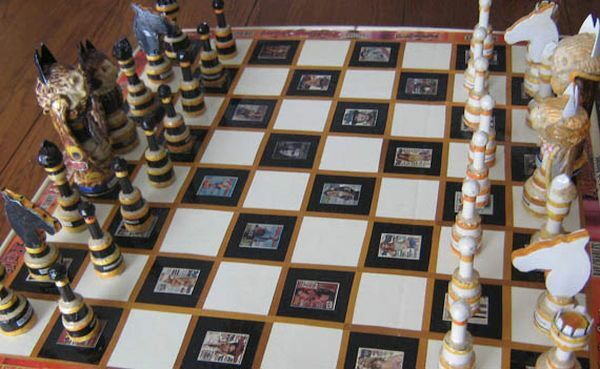 While the standard chess sets featured a plain, boring wooden board and pieces, the more modernistic versions seem to attract the gamers more with their unique designs. For the minimalists out there, however, handling bulky chess board along with the pieces is always a headache. 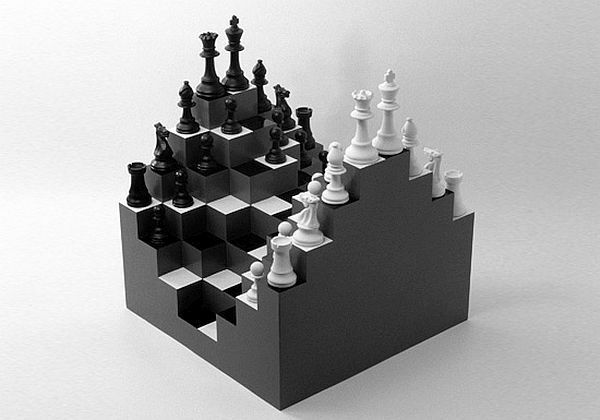 Therefore, to solve this problem, designer Lanier Graham came up with this minimalist chess set. The game of chess is possibly the best time pass while on an extended voyage or journey, but you cannot move your bulky chess sets with you all the time. Have a look at this modern chess set by Lanier Graham, which presents a minimal yet functional design to keep you busy and entertained on the go. An official part of MoMA’s collection, the portable chess set includes pieces designed to reflect their relative importance and the range of mobility on the board. Users can recognize each piece with its unique size and shape, such as knights present the “L” shape, bishops slope diagonally, and so on. Now, all you need to do is find an equally efficient player who could counter your moves. 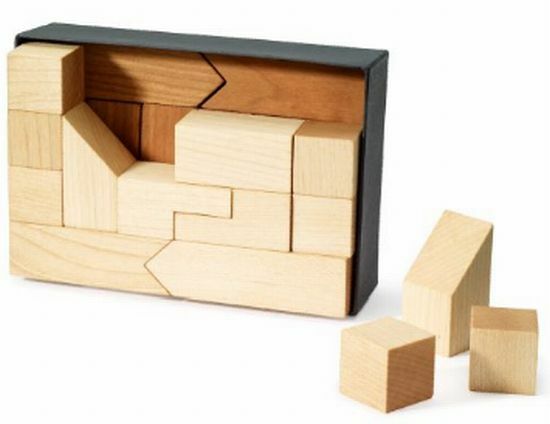 In case you don’t find anyone, you can take all the pieces off the box and reassemble them like a puzzle in the compact box. Featuring the pieces made in cherry and maple wood, with a natural oil finish, to differentiate each side, the minimal chess set (without chessboard) is available for $65 at the MoMA Store. If you are not a minimalist but a chess enthausiast, then don’t worry. Here are some of the most mindblowing designer chess sets that would surely tempt every chess lover. Designed by AdinMumma, this incredibly creative wooden chess set brings some much needed liveliness to the otherwise intense game, with the help of wobbling figures. 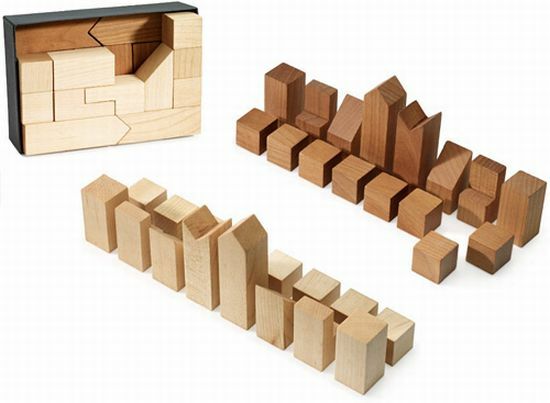 The concave shaped landscape helps prevent these wiggly and wobbly pieces from trembling off the board as they move around it with great gusto! This is definitely one chess board that would have the spectators hooked to the game as well. Here’s another unique chessboard that is simple and very easy to recreate in your own home. 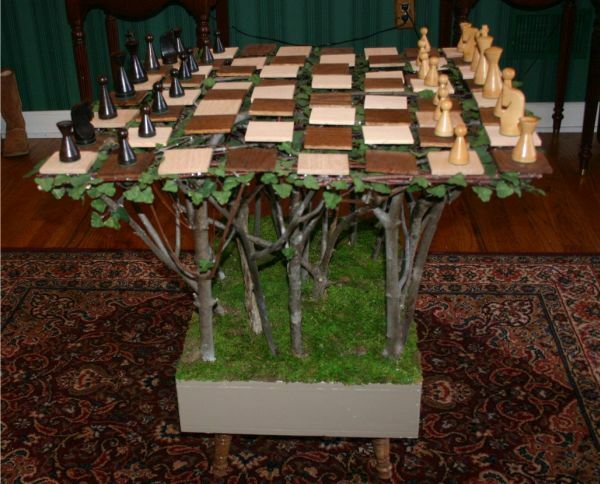 The floating branch chessboard starts with a wooden box at the base. Stick some vertical stems on both sides of the box to ensure that they reach the same height. Stick a handful of plastic leaves at the top of the stems to create a canopy of sorts. Your floating branch chessboard is now ready. You may want to stay away from this one if you detest critters, especially mice. 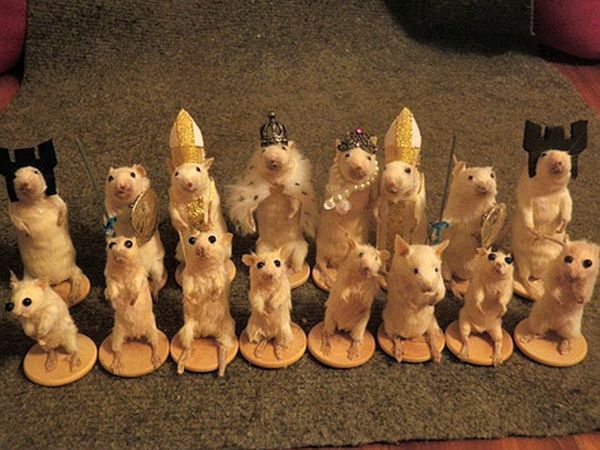 The taxidermy mice chess set features (you guessed it..) taxidermied mice along with plenty of other materials like cotton, foam, fur, beads, wire, wood, fabric, paper, paint and glue. The mice are dressed in appropriate attires (as per the position and rank on the board). So all you would need to do is roll the dice and simply move these mice. How about playing chess in a 3D board that allows you experience a more lifelike view of the entire game? The 3D chess board comes with the same wooden chess board and pieces, but has an interesting twist in its design. The 3D chess board features a checkered, raised terrain that places different pieces in different heights based on their position. 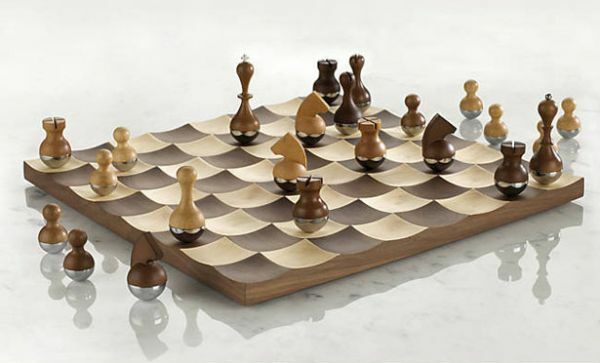 In addition to enjoying a game or two on this unique chess board, you would actually appreciate the climb to victory. If you are a fan of the Rolling Stone, then you would probably relate to whose ever idea it was to create this rolling stone chess set. Everything from the playing surfaces to the pieces themselves has been handmade from Rolling Stone magazine. The chess set comes with a glossy finish to protect the magazine covers. Revitalizing the classic game of chess, Russian designer Yar Rassadin inspired by the ring symbol has devised a unique chess set that presenting a curvy design adds to the elegance of the traditional pieces. 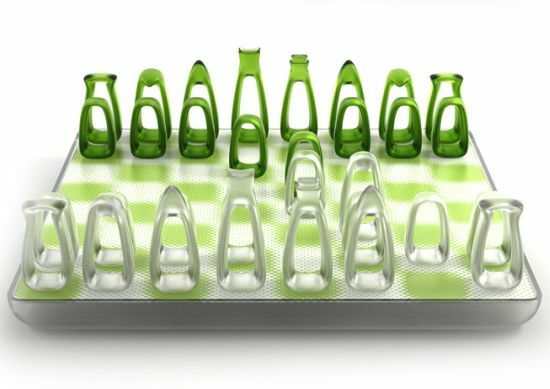 Called “Air Chess,” the see-through chess set is finished with colored transparent plastic, which makes it extremely lightweight and sleek for the trendy warriors (users). All the pieces feature a hole within that apart from stressing the symbolical approach to design also lays emphasis on the status or position of each figure on the battleground. Displayed at the Off the Hook Exhibition 2009, the “Urban Chess Board” by milbec, a small Vancouver-based design partnership, is a public chess board that not just entertains the passersby but also helps in sustaining the environment. 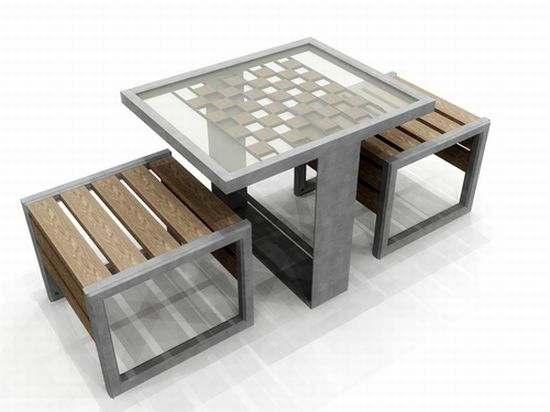 Finished with a discarded telephone booth, the Urban Chess Board comprises a chessboard integrated table with a glass top, together with two stools to sit the players, giving a whole new meaning to the classic game of chess. The Skeleton Key chess set fits perfectly on our list of the most unusual and interesting chess sets. The strange chess set has been designed around the function of skeleton keys that are made of brass. The most interesting thing is that while the top of every key differentiates it from the other, the bottom of every key is the same. It means every key is designed to fit any slot on the chess board. These holes look like the the ones we have on doors that open with a key. 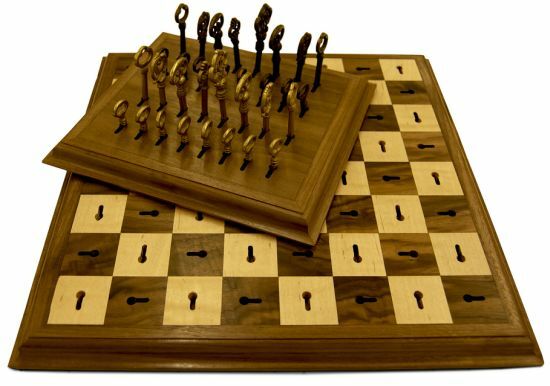 While the whole idea of this skeleton key chess set looks innovative and unique, it will kind of trouble the players putting the keys in and taking them out, especially if it’s a blitz chess game. But still, hats off to Dave Pickett for thinking the different. Sigourney Weaver gave a stellar performance in the movie Aliens. It even won her an Oscar nomination in the Best Actress category. After so many years, you can re-live this cult film in an eccentric fashion with this exclusive Aliens Chess Set. Pitting space marines against the aliens, the chess game recreates the battle between the queen alien and the marines . Totally inspired by this James Cameron classic. Moreover, even the board resembles the metal floor of the space station in the movie. Ellen Ripley’s side of the board takes on the space station avatar. 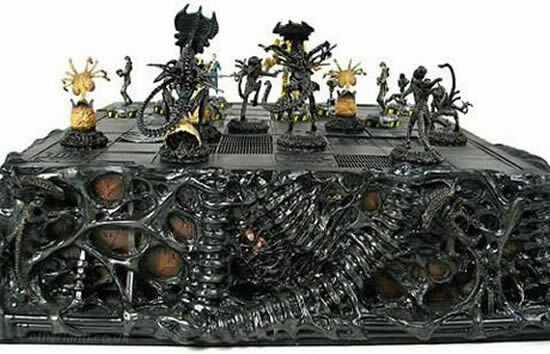 On the other hand, the Alien Queen’s side looks just like it’s being taken over by the menacing brood. Beneath the Chessboard, there is a storage compartment to house the precious alien and marines figurines. Playing a game with the Grand Masters on such a unique board will be precious. 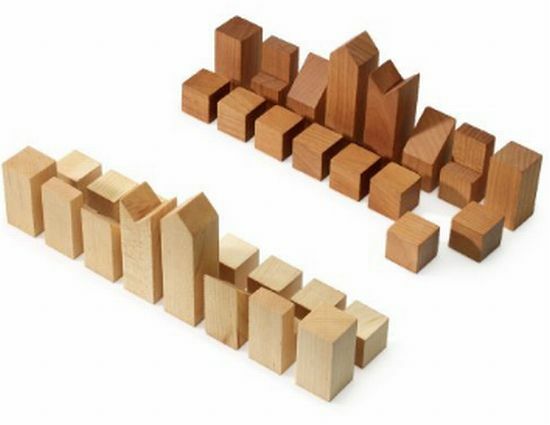 Why play chess in the same old wooden chess set when you can opt for something more creative and out of this world? These chess sets have surely added a new twist to an otherwise intense game, making it all the livelier for the players as well as those watching them.